You suggest that a manager must push work to the team and that is the only way to gain control. I pushed work to my team and things got worse. Chaos emerged. I was better off before. I had to step back in and take control. Of course, things got worse. It was a seduction. You pushed decision making and problem solving to the team and they panicked. This not-so-subtle shift of accountability from the leader to the team sent the team into panic. As long as the manager is making all the decisions and solving all the problems, as long as the manager is barking orders, raising the voice of authority, repeated lecturing about misbehavior and underperformance, the manager has all the accountability. It was a seduction. When accountability shifted, the team panicked, chaos ensued and the seduction began again, to have you, as the manager step in and take it all back. The most effective position for the manager in this seduction is very simple. Outlast the panic. This entry was posted in Accountability and tagged accountability, control, delegation, leader, manager on August 11, 2017 by Tom Foster. Sometimes, at work after hours, it is quiet and I ask myself, why am I here? I should be home with my family. But, there is still so much to be done. And if I don’t take care of some loose ends, something critical will blow up tomorrow. I feel guilty, responsible. But, the harder I work, the more things seem out of control. You are not the only manager thinking that thought. This is a self-inflicted wound. So, you have to think if something doesn’t change, about the way you manage your team, what will happen? What will happen in another week? What will happen in another month? What will happen in another year? You likely feel tired every morning. You stopped working out because I don’t have time. You feel like a cold is coming on. And you still feel out of control. This is counter-intuitive. You feel like you need to work more. My suggestion will be to work less. Determine the work that is necessary to be done. In the work that is important, determine the level of work that is necessary for you to work on and the level of work that is necessary for your team to work on. Stop doing the work your team should be doing. Assign the work and spend your time coaching instead of doing. You are a manager, not a technician. The more you work, the less control you have. Ask yourself this question – If I were to work less, how could I have more control? This entry was posted in Accountability, Delegation Skills and tagged control, delegation, manager on July 21, 2017 by Tom Foster. “And, what did you discover?” I asked. “And, why did you think that?” I pressed. 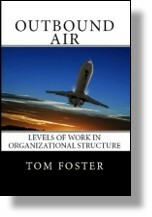 This entry was posted in Leadership and tagged authority, control, leadership, manager on March 3, 2015 by Tom Foster. This is the fourth in our series, Six Sins in the Hiring Interview. This series is a prelude to our Hiring Talent Summer Camp. I realize I haven’t heard a word the candidate has said for the past four minutes. Then I realized the candidate has been talking non-stop for the past four minutes. “Can you tell me more about the company?” the candidate asks. “Great company,” I reply and recite a brief thumbnail about the enterprise. I suddenly realize 45 minutes has passed, I know nothing about this candidate and I have two more waiting in the lobby. I lost control of the interview. Happens all the time, often with a full complimentary tour of the building. Why do we lose control of the interview? the person answering the questions? the person asking the questions? On the surface, it appears the person doing most of the talking must be in control, when, in fact, it is the person asking the questions. Why does the interviewer lose control? Most interviewers walk in the room with a written list of 4-5 questions. The more time the candidate fills, the fewer questions required. “I had five prepared questions, but I only had to ask the first two, the candidate was really responsive, a good communicator. I kind of liked him.” Who was in control of the interview? Here is the good news. If you suddenly realize you have lost control, you can immediately regain it by asking your next question. You do have a next question, don’t you. From your list of 60 prepared questions. The person asking the questions controls the interview. Our Hiring Talent Summer Camp begins next Monday, June 18, 2012. It’s online, and you will have several chances to make that first impression. This entry was posted in Hiring Talent and tagged control, hiring manager, hiring questions, interview, manager, questions on June 14, 2012 by Tom Foster.